It was a beautiful afternoon to enjoy lunch on the restaurant’s outdoor patio. 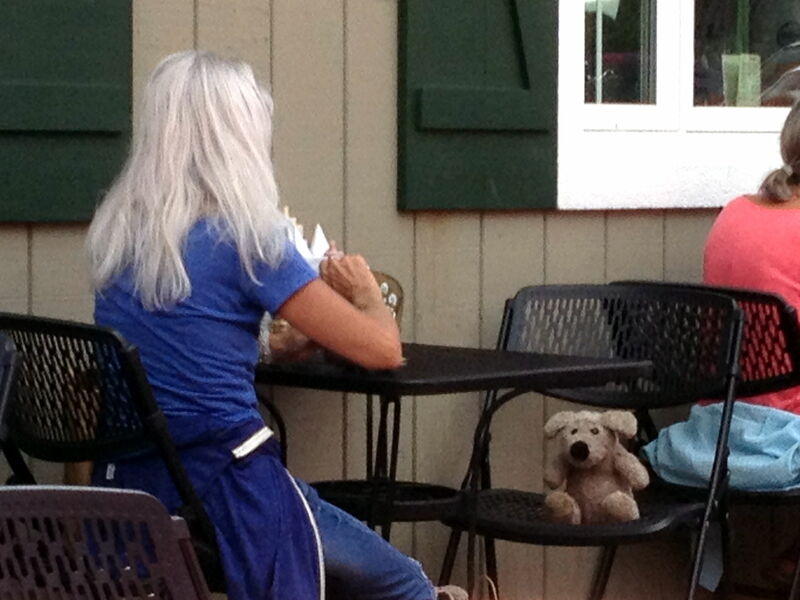 We were waiting for our meal when I noticed a lady sitting alone at a table near ours. What I saw in the chair across from her intrigued me. I looked around to see if anyone was watching, and I quickly recorded the odd scene with my cellphone. Normally, I would just make up a story to fit an unusual situation like this, but the lady’s melancholy movements kept drawing my attention back to her. Half way through my burger–completely out of character for me–I excused myself. The lady seemed less startled than I was when I turned an empty chair around next to her table and swung a leg over the seat. She drew back, ever so slightly, pursed her lips, and looked me over. Her watery blue eyes narrowed, but she finally sighed and shook her head. Just once. A tiny smile brushed across the fine lines on her cheeks and then hid behind the clouds in her eyes. She tilted her head at the chair across from her and glanced at the quiet gray form in the chair. Without moving her head, her eyes came back to me, and both eyebrows lifted a fraction of an inch. “Yes. I’d like to hear his story, too. And yours. From you. Well, of course, from you.” I could have sworn I heard a chuckle from that quiet gray form. But no one counts on my hearing for much of anything. A moment of silence quietly passed between us. A tired smile slowly reached the faraway look in her eyes. We both looked at the quiet gray form in the chair across from her. This entry was posted in animal companions, imagination, inspiration, miniature schnauzers, story ideas on September 8, 2016 by RMBadmin. At eighty-seven, Dr. Russell Dohner still sees patients who come by his office off the town square in Rushville, Illinois, just like he has done for the past sixty years. But time marches on, and Dr. Dohner has been forced to more than double his fee for a first-come-first-served office visit. On their way out, each patient now pays Edith Moore, the eighty-five-year-old secretary, a five dollar fee. Dr. Dohner doesn’t accept medical insurance–he says it’s not worth the bother. “I always just wanted to be a doctor to help people with their medical problems and that’s all it’s for. It was never intended to make a lot of money.” You can read more of Dr. Dohner’s story here, in the LaCross Tribune. From the late 1950s, I grew up in a small, rural town in northeast Ohio. There was a little white house across the street from us, where Dr. List had his office. With wisps of gray hair, black-rimmed glasses, and a white coat, Doc List stitched me up when I fell partway through a glass storm door, prescribed medicine whenever I got sick, and he even fitted me with my first pair of glasses. My parents always paid him in cash. Back then, Doc List either didn’t take medical insurance, or we didn’t have that kind of insurance. I’m not sure which was the case, but whenever we needed medical care, we just walked across the street. Fortunately for me, Doc List’s son followed in his father’s footsteps. 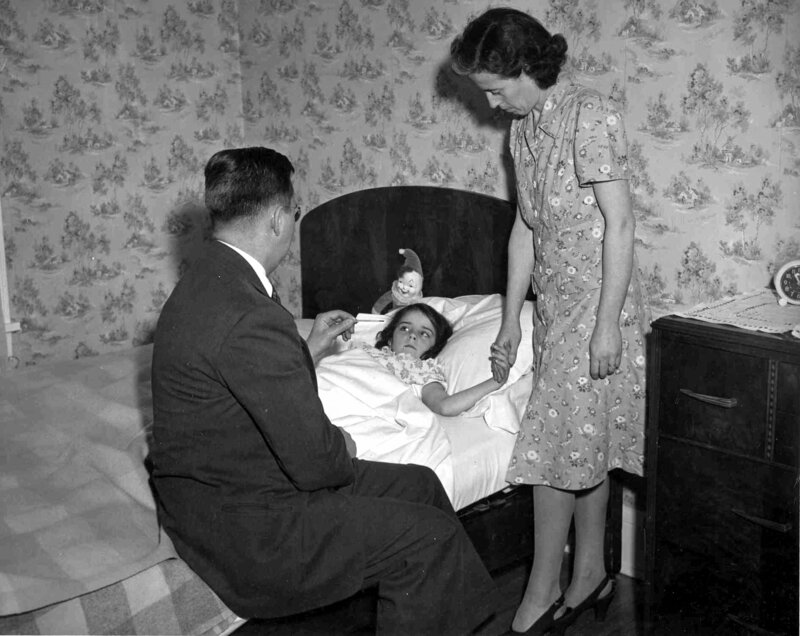 When I was about thirteen, and too sick to even walk across the street, the young Dr. List made the last house call I can remember. He ended up sending me straight to the hospital with a 105 degree temperature, and a bad case of viral pneumonia. In the story, An Irish Miracle, Doc McGowan makes a house call to look after Alastar Connolly, after he took a nasty fall and split his head open. Dr. Dohner, both Dr. Lists, and Doc McGowan are caring, dedicated country doctors. The only difference is that Doc McGowan was a large animal veterinarian, affectionately, a horse doctor. Since his patients usually weighed well over 1000 pounds, it wasn’t really his fault that he might have been a little heavy-handed with the local anesthetics he administered to Alastar. Would you trust an old country doctor, like the ones in this story, with your medical care today? Their training and methods might have been from a bygone era, but they each cared deeply for their patients, many of whom were also friends and neighbors. Going to a doctor’s office these days seems to begin with “Has your insurance changed?” instead of “It’s nice to see you, how are you feeling?”, and end with a string of cryptic billing statements and frustrating telephone calls that can stretch out for months afterward. Something in between might be nice. This entry was posted in An Irish Miracle, inspiration, lost traditions and tagged country, country doctors, family, farmer, nostalgia on November 15, 2012 by RMBadmin. In the story, An Irish Miracle, Alastar Connolly’s horses were not only his companions, they were his best friends. Friends that always listened. Friends that never judged. (Well, almost never.) During dark times, Alastar’s horses were his only family, and he often slept in their stalls, burrowed deep in the fresh hay. A real-life Alastar Connolly made the local news recently. A state fire marshal inspection on the backstretch of the Cal Expo Harness Racing Track near Sacramento ousted farrier Johnny Walker, and many other grooms, from the barn tack rooms where many of them had been living for years, near the horses they cared for and loved. "He's my family," said Walker, 64. "I've had him since he was a baby. "As long as we're racing and keep making money, that keeps me going,"
Walker said. "But if I couldn't keep (my horse), that scares me." Hopefully, after renovations ordered by the fire marshal are completed, Johnny Walker and his fellow farriers and grooms will be reunited with their living quarters, and their horses, at least in the short term. Tack rooms were never meant to be permanent places of residence. friends that I loved as family." 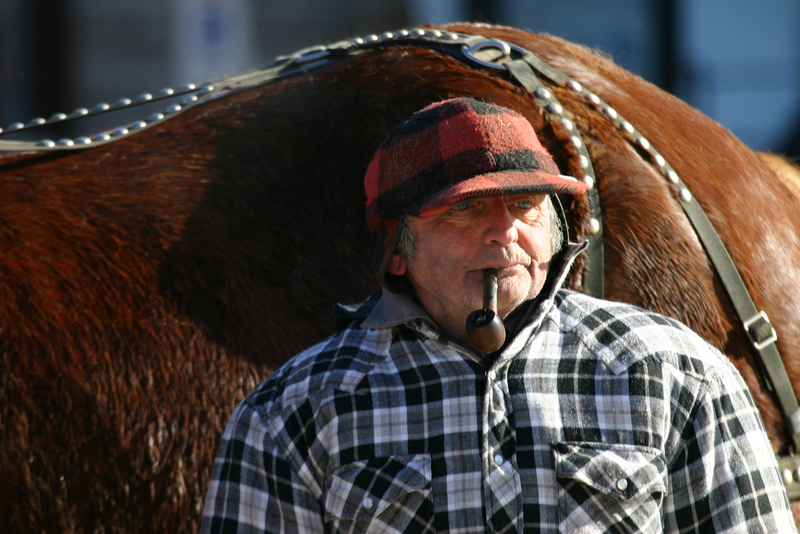 You can read the story of the real Johnny Walker (not the pipe-smoking gentleman in the picture above) and his horse, The Goose, in the article Cal Expo racetrack workers scramble to find housing during renovations, on The Sacramento Bee website. My editor, Robin Martin of Two Songbirds Press, brought Johnny Walker’s story to my attention. Having an editor who expertly helps me polish my words, and who watches out for me between manuscripts, is truly a blessing. Thanks, Robin! This entry was posted in An Irish Miracle, animal companions, imagination, inspiration and tagged animal companions, animals, companion animals, family, horse, horses, ireland on October 10, 2012 by RMBadmin.